As on 25 December the conditions were: fine and Dead4, rail true. 2mls rain forecast race day morning. 1.18 p.m. R2 1 Bocce (2 c Foxwedge – Whiffle, by Red Ransom) – Jake Bayliss; won on debut over 1000 metres on 1 December at Otaki, defeating subsequent Wakefield Stakes (Gr. 2, 1200m) winner Xpression (Showcasing). Continuing to go the right way since, he has the addition of blinkers in the $50,000 2YO 1100 metres and appears set for a bold performance from barrier five. Fixed odds: $6.00 & $2.00. 3.38 p.m. R6 3 Savile Row (4 h Makfi – Fleece) – Leith Innes; resumes off 66 days in the $60,000 Hallmark Stud Handicap (Listed, 1200m). Runner-up three times at the ultimate level last season: 2000 Guineas (Gr. 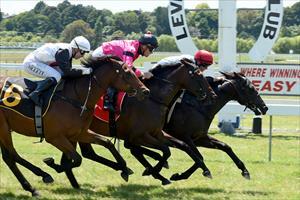 1, 1600m), Levin Classic (Gr. 1, 1600m), and weight-for-age Herbie Dyke Stakes (Gr. 1, 2000m), he was a course/distance winner in a fresh state and while destined for considerably further he has the class to figure. Fixed odds: $15.00 & $4.00.